If we’re fortunate enough to have our parents live a long life, there will come a time where we have to consider how to best care them in their old age. While some people may choose to move their parents into a nursing home or an assisted living community, others might decide to shoulder the responsibility and move their elderly parents in with their family, right into their own home. While there is no right or wrong path you should pursue, moving your parents in with you can have many benefits, as well as challenges. 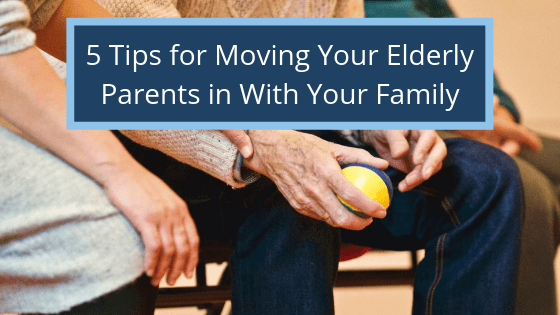 For those of you considering moving your parents in with you, My Tucson Movers has put together a list of tips to guide you through this transition. Before making the decision to move your elderly parent into your home, you must consider your finances. Can you afford to take care of an extra person? Does your parent have any specific dietary needs or anything similar that may impact your finances? All of these questions and more should be answered before you make a decision. Have a discussion with them so both of you know exactly what to expect when going in. The more clearly everything is communicated, the better things will be for everyone involved. Sometime, when people move their elderly loved ones in with them, they are still fairly independent and can do most things by themselves. Other times, they may need round-the-clock care to help them move around, eat, and take care of their basic needs. In either situation, make sure you are fully aware of the amount of care your loved one will need and how you will handle their needs. If they need full-time care, who will be the primary caregiver? Will you hire a professional caregiver or nurse, or will you take on the work yourself? If you decide to hire someone, can you afford it? If you decide to take on the responsibility, does this mean that you will have to take a step back from your career? How will this affect you personally, professionally, and mentally? It is also important to take into consideration that your parent’s health and needs may change – when they first move in, they may be independent, strong, and even a trusted babysitter for your children, but this could change over time and they may end up needing more serious care. Think about how you want to handle this new stage in life and be as prepared as possible. When deciding whether to move your elderly parent into your home, consider how you can make your home comfortable – and not just for your parent. Think about your kids’ and spouse’s feelings and needs as well as your elderly loved one. How will you make sure everyone is comfortable? Make sure you have enough space to give everyone the room and privacy they need. Specifically for your parent, however, make sure your home can accommodate their needs when it comes to mobility. Depending on their mobility, they may not be able to handle walking up and down the stairs – do you have a bedroom downstairs or an office that you could convert into one? Perhaps they are in a wheelchair and you will need to make sure that your home is wheelchair accessible, so they can navigate through doorways, into the bathroom, and other wherever else they need to go. Additionally, make sure your home doesn’t present any hazards for your parent, such as an area rug that could cause them to trip or inadequate lighting which would prevent them from seeing properly. You may also want to consider installing grab bars in the bathrooms to make sure they do not slip and fall while taking a shower or using the restroom. If you need more tips on how to make your home safe for your loved one, take a look at this home safety checklist. No matter how close you are to your parents, having them move in with you can be a lot of new responsibility that can cause tougher times and arguments. Always remember that you are doing this because you love them, even in the tough times. During those difficult moments, it can be difficult to remember why you are doing this and you may begin to question whether it was a good idea. That’s why, before your parent moves in, you should get a piece of paper and a pen and write down all the positive aspects of having your parent move in with you. Perhaps they can babysit your children when you and your spouse want to go out on a date night, or maybe it will teach your children to be more empathetic. Brainstorm and write down as many advantages and good things about having your parent live with you, and put it somewhere safe in your bedroom. Then, any time you are having an argument or are having a moment of doubt, you can look back at the list and remember all the amazing reasons why having them live with you is the right decision. Your parent probably has more than a few cherished items in their home that they do not want to part with. This can be anything from small figurines to pieces of furniture. Decide with them what you have room for in your home, what they should sell or donate, and what they should throw away. Having their favorite possessions around them will make them feel more comfortable with the situation and more at home. You’ll need to do some redecorating to make things work… whether that means something simple, like placing their favorite vase above the fireplace or something more major, like replacing your living room couches with theirs. Once you decide what you will keep on display in your home, what you will pack away in boxes and stow away in your attic or storage facility, and what you will get rid of, start helping your loved one pack up their things. Remember that this is an emotional time for them as they are probably not only sentimentally attached to their home and its contents, but also because they may feel embarrassed that they are no longer capable of living alone. Be patient and loving towards them, and reassure them that you are excited to have them move in with you so they can spend more time with you and your children. Whether you and your loved one decide to just move a few items or an entire home, My Tucson Movers will treat their possessions with the utmost care and respect… just like they deserve. Give us a call today at 520-822-6140 or contact us here for a free quote! 5 Tips for Moving Your Elderly Parents in With Your Family Overall rating: 5 out of 5 based on 14 reviews.